Gardening, canning, preserving, and whatever else it takes to fill a Christmas gift exchange basket. Salt-cured lemons, aka Graved Lemons, are something completely new to me. I’m making them as part of the February portion of the Food in Jars Mastery Challenge: preserving with salt. I’ll save Herbes Salées for the summer when I have fresh herbs in the garden, but our citrus is cheap during these frozen months, and the point of the FIJ Mastery Challenge is to try something new, so salt-preserved lemons it is, (plus, everything I read about them says they’re delicious)! I followed what appears to be a “traditional” recipe – quarter the lemons, leaving the ends attached, put a bunch of salt into the cuts, and jam them into a jar with a bit more salt. 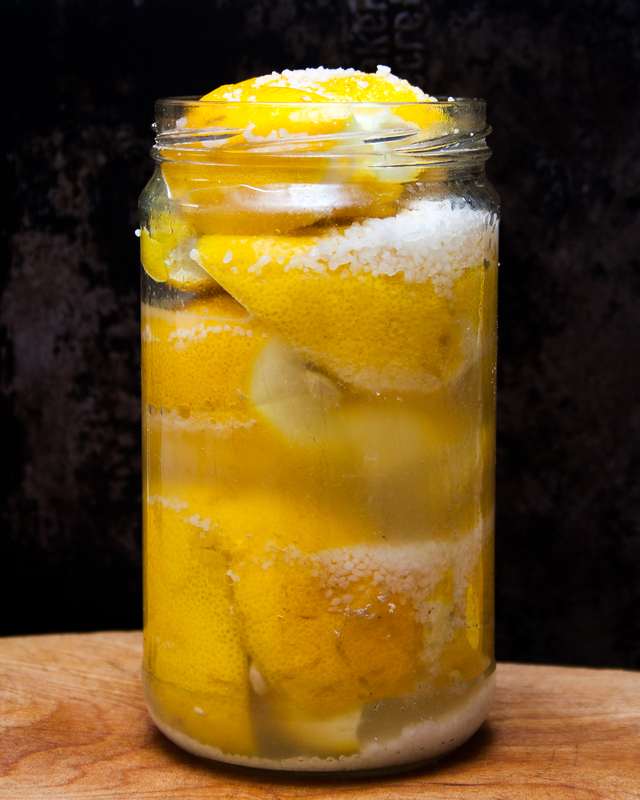 Here’s the Food in Jars recipe for Preserved Lemons. These aren’t hand-picked in an artisanal, pesticide-free orchard, I bought them from a normal grocery store, so they were probably sprayed, waxed, and the whole deal. 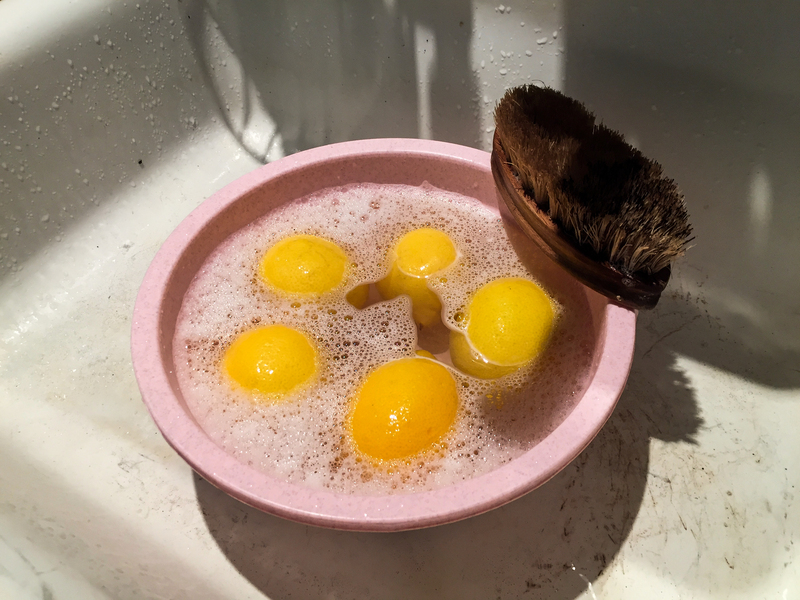 Time to give them a good scrub. 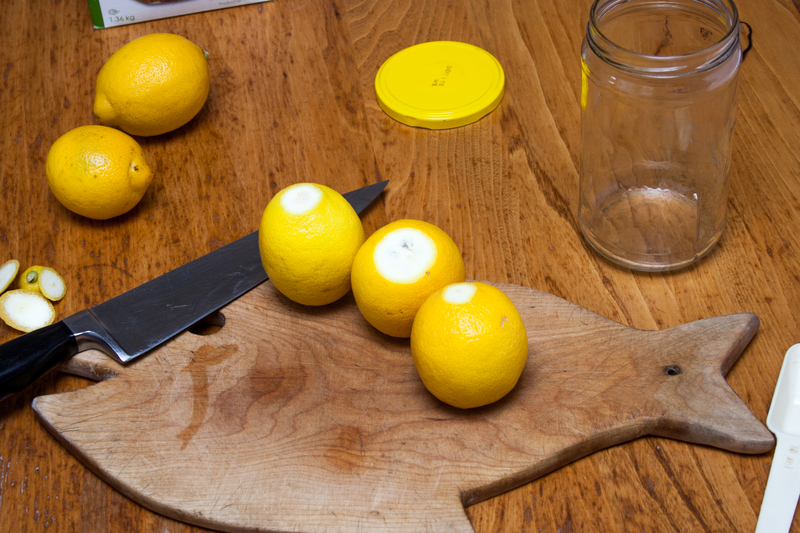 Chopping the ends off of the lemons – we want preserved lemons, not preserved lemon stems! Add salt in the cuts of the quartered lemons, and a bit more around the lemons as you pack them into the jar. You might have to push hard to fill the jar without massive spaces. This step is currently in progress. Yes, that says fermentation. According to The Art of Fermentation this is a lactic acid ferment of fruit. 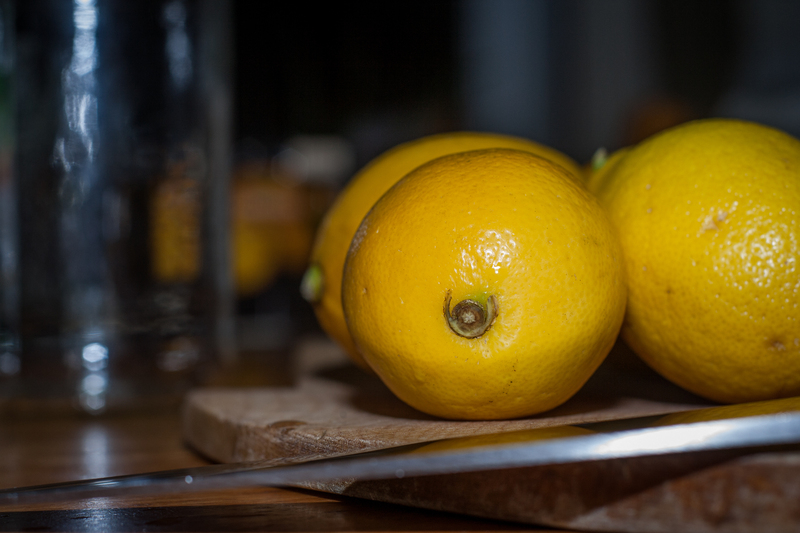 The salt prevents any yeast from fermenting the sugar in the lemons into alcohol by yeast, but lactic acid bacteria tolerates some salt and likes acidic environments. Because this is fermentation gas needs to be let out of the jar, either by not quite sealing it, using an airlock, or opening it sometimes. Depending on where you look there’s a huge range in recommended salt levels and ferment times. In the Art of Fermentation Sandor Katz quotes recipes ranging from 9 tablespoons of salt for 2 pounds of lemons, down to 4 tablespoons of salt for 10 pounds of lemons, and three to four weeks of fermentation before refrigeration, compared to Marisa’s 3 days in the Food in Jars recipe, and Jamie Oliver suggests a month. Because of scheduling mine will be out for at least two weeks, after which I’ll check them and decide what to do next.